Newmarket Stables is currently planning a lot of renovation work to bring the yard into the future. Watch this space for all news and events happening in the yard. Thank you all for such a successful Christmas show at Newmarket. We appreciate the supported and look forward to hosting many more shows in the year to come. Here's just a few comments of positive feedback we received and really appreciate!! Thank you and congratulations on a really successful and well run show. My boys had an awesome day yesterday and it really opened our eyes to how much Newmarket has changed. Please have more shows as it was such a pleasure to attend yesterday. Thanks Cindy, was a great day and all the riders showed good levels of discipline in some tricky conditions. Just another thank you for a great show - it was so well organized and a pleasure to be at. Very willing and forward going. Honest jumper with lots of potential to go up the grades. Not a novice ride as he can get excitable. Suit confident experienced junior or young adult. Option to compete negotiable with a full lease. Newmarket Stables is now a REGISTERED SAEF CLUB!! All existing members to please fill out new membership forms. Any riders wishing to join Newmarket stables in order to comply with SAEF registrations please email us for membership forms. Please don't hesitate to ask if you need any help. Congrats to everyone for a wonderful SANESA Qualifier. All the riders rode really well!! 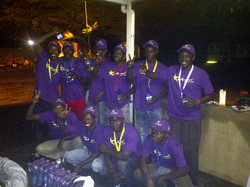 Here's the winning soccer team from the grooms soccer match held on the Saturday evening after the first day of the show!! Thank you to everyone who organised and participated. We hope you all had fun!! Unaffiliated training dressage show held by Nadine Parker at Newmarket stables. Stabling is available for anyone wanting to stay for the jumping show the next day!! Jumping training show being held at the Cycle Stadium next to Newmarket stables. Starting from small crosses on the ground and going up to 1m. ALL ARE WELCOME!! Entry forms in the office or downloaded here... you can enter on the day! The first training show of 2012 is on the 26 February! The entry form is downloadable below. Or you can get it from the office or ask for it to be emailed to you! The jumping training show is this Sunday, entries are still available in the office! 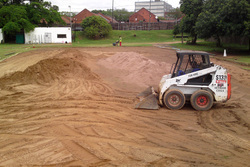 Newmarket Stables is proud to announce that they are in the process of putting in a new, professional dressage arena. 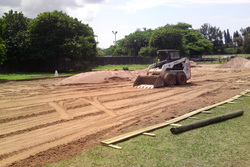 The arena will be a sand arena, made with sand specially manufactured for dressage arenas. 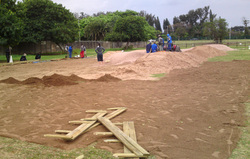 The arena will be completed by the end of the week, pictures to be posted soon!!! Please look at the events page for information on the training show. There will be a holiday course in October from Tuesday 4 - Friday 7 October. The course will run for those four days from 8am to 1pm . The cost is R500 per child. Each day will include a riding lesson so it is first come first serve as there is a limited number of ponies. To take part in the course or for more information please email Mary-Ellen on pinopano@telkomsa.net , or contact the office. Here is the new wash bay that has just been fixed up and re-concreted. 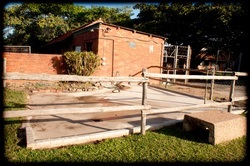 Thanks to Matthew for all the hard work in creating a beautiful looking wash bay for our horses!